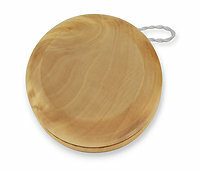 Real Maple Wood Yo-Yo. Standard braided string (approximately 85 mm) looped on axis to allow for tension adjustments simply by twisting string. Perfect gift for the kid in all of us! Maple Wood with Lacquer Finish. Size 2" diameter. Includes black PVC hang tab.